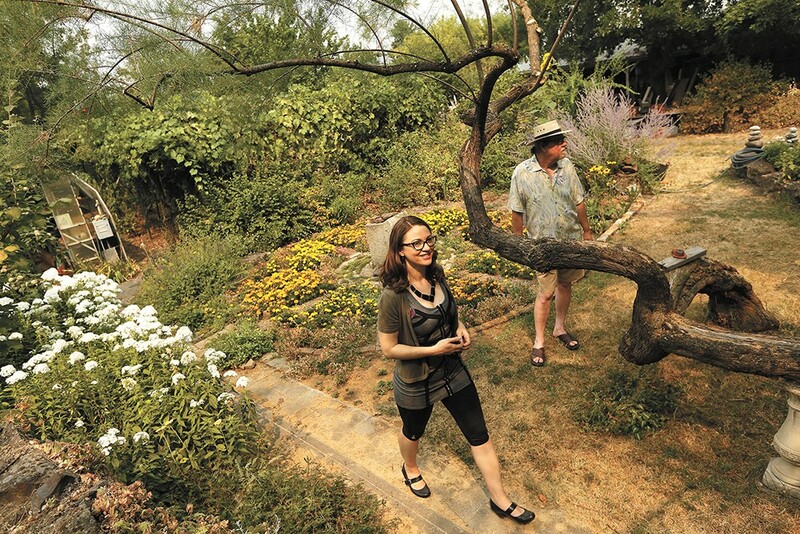 Mariah McKay and Chris Nerison stand in the garden they hope to tend as neighbors in a new community they're planning. You're a parent with young kids. You come home from work, already tired, but tonight, instead of having to gather enough energy to figure out what to cook, your neighbor's already got you covered: Dinner is on the table. Or you're a retiree who wants to maintain your independence, but have more contact with younger neighbors. You want to garden, but many projects would seem too daunting if you were going it alone, so you work with your community to maintain a plot, making the workload light. A Spokane group with members in all phases of their lives is trying to make this type of community a reality, by intentionally designing a neighborhood of homes that are eco-friendly and more socially oriented than most American dwellings. They plan to share meals with each other on a regular basis, maintain shared green space, teach each other their trades and talents, keep an eye on each other's kids while they play, and perhaps most important: They plan to really know the people who live next door. It's called cohousing, and it would be the first development of its kind in Eastern Washington. 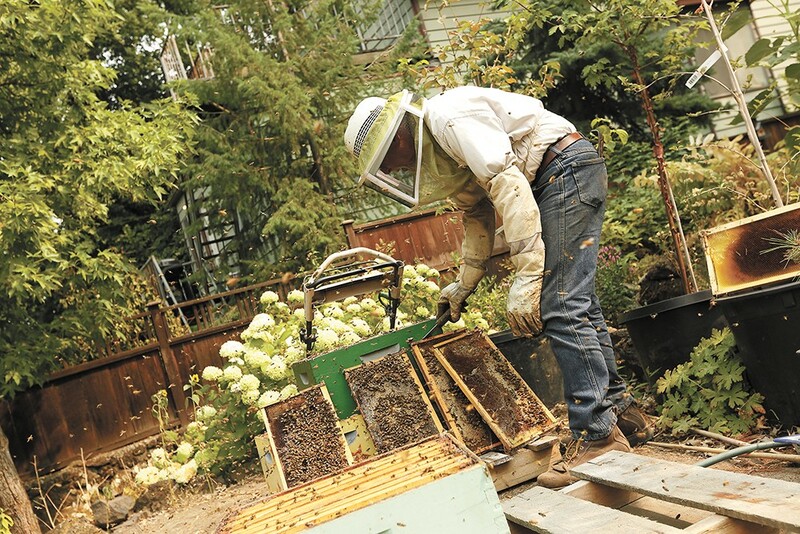 Lars Neises, tending bees, and Rebecca Laurence (not pictured) have agreed to sell their land to the cohousing group. Walking around a 3-acre site near the Perry District in East Central, Mariah McKay points out the many amenities on the land that the Spokane Cohousing group now has a purchase agreement to buy. It's home to the studio space currently used for Spokane Yoga Shala; higher up the hill on Garfield Street, just below East Eighth Avenue, an organic urban farm takes up three-quarters of an acre between a shop and a greenhouse. On a lower portion of the property, apple trees hide behind a solar array that powers the Haystack Building, which is home to the yoga studio and a handful of apartments. The plan is to ultimately fit a total of 36 units on the multifamily site. To the 33-year-old McKay, a development novice, the site seemed too small at first, but it turns out there will be plenty of room for them to build townhouses and flats while maintaining green space for the garden, places to meditate and room for children to play. A centralized community building with a commercial kitchen will play a key role, as it does in cohousing communities around the country. "Right now in modern neighborhoods you have as much privacy as you want," McKay says. "In cohousing you have shared space among people you know and trust, but you can also retreat into your own place." McKay, a public health educator in Spokane, and her husband, Jim Dawson, program director for Fuse Washington, started Spokane Cohousing with the intention of raising their future kids in a supportive community. To start, they partnered with Susan Virnig and her husband, Bob Stilger, who've lived a block from the site for 40 years, as well as with CHAS Health doctor Bill Lockwood and his wife, Nikki, who have two daughters — Ellary, 16, and Risa, 14. The Lockwoods will be on their way to being empty-nesters by the time the community is built. A common theme for several families involved: They're ready to downsize from larger homes and have a desire to share the workload of day-to-day living. "I have a big, beautiful house and I'm tired of cleaning it by myself — my teenage girls, surprisingly, are not into helping with that," Nikki Lockwood says. "I think a lot of us want to be a part of something, and not just be doing it alone." Many cohousing communities offer guest rooms in a shared building that can be used by relatives and friends by scheduling in advance, which saves on space and keeps everyone from heating, cooling and cleaning a bunch of empty space for most of the year, McKay says. Lockwood says she loves to cook, just not all the time, so she's drawn to the idea of living in a community where meals could be prepared by neighbors four or five days a week, with each household cooking one of the meals about once a month. Cheney retirees Christie and John Bruntlett, 76 and 82 respectively, got involved in the project after reading a column McKay wrote about cohousing as a contributor to the Inlander. Christie had been searching for cohousing after visiting a cousin who lives in a cohousing community in Fort Collins, Colorado, last year, but while there are several cohousing communities in Western Washington, there wasn't anything east of the Cascades. "I liked that it was a cohesive community of people who live in close proximity by choice, and that there was a cohesiveness in the group," she says. "They look out for each other: They can look out their kitchen windows to see children playing in the walkway between homes, and parking is around the perimeter, so you don't have cars where children are playing." She and her husband have looked at retirement communities with their kids, but agreed that's not how they want to spend the rest of their lives. Cohousing will offer them the chance to age in place. "We've lived in our house 50 years now. ... We raised our family here. We've got a large house, large garden, large yard that we don't need anymore," she says. "I don't have to give up gardening because I give up this huge area. [In cohousing] I can garden as much or as little as I would like to." The community also promises the chance to keep up their activities, learn from each other, and teach: John plays trombone and racquetball regularly, and Christie does volunteer work in the community. Other members include teachers, writers, published authors, medical professionals, musicians, engineers, scientists, activists, realtors, facilitators, an architect, a winemaker, a TV producer, organic gardeners, marketers and cycling enthusiasts. "This is an intergenerational community that we want to be part of," she says. The upfront costs to build housing from scratch are steep, which is partly why younger families tend not to get involved until much later in the process, McKay says. They usually aren't able to put up as much money at the front end, and may be more wary of the risks of investing in a project that hasn't been built yet. For now, those who are seriously interested in joining the development can become "associate members" for $150, after which they are brought more into the fold and can decide whether the investment is something they would like to make. To become a full member costs another $350, and currently the group projects that the full costs for construction (for prices three years from now, as construction costs continue to rise) will be about $225,000 for a one-bedroom, one-bathroom unit, and $450,000 for a four-bedroom, two-bathroom unit, McKay says. "I really hope we are able to accommodate younger families, because I look forward to the intergenerational aspect of it," Lockwood says. A few years ago, Abby and Rob Roose, and their daughters Robin, 14, and Lena, 10, lived near a cohousing community in Port Townsend, where they were often invited to meals and the girls were welcome to play. They moved back to Spokane in 2009, and for Abby, who moved around a lot when she was growing up, part of the draw to cohousing is really knowing your neighbors well. "A lot of people have friends they may have known all their lives, and when you move as much as I did, you don't really get that. I want my kids to have that," she says. "My husband had that growing up. ... Everybody looked out for each other, he knew everybody on the street. I think that's been lost in large part in modern society." Their family hasn't fully committed to the project yet, in part because of the financial considerations. It's expensive, she says, but there are other benefits that should be considered. "I just think for us, we want to have a life with people in it, and a life that's environmentally friendly, and is less about stuff and more about enjoying life and having great experiences," she says. "And I think cohousing is a great way to make that happen." One major thing that Spokane Cohousing has going for it, aside from having land under contract to purchase, is their consultant: Kathryn McCamant of CoHousing Solutions. "Besides writing the book on cohousing, she's been involved with so many of the developments in the United States," Lockwood says. "[Cohousing is] really unique, but it's been tested over and over again, and it gets tested with more and more developments. That part makes it seem not as risky." McKay says that at the various information sessions they've held, where as many as 70 people have attended to learn more, the most common reason people give for their interest is a feeling of social isolation. "For two-income-earner households, people don't have the leisure time or the social flexibility that they used to," McKay says. "Cohousing is a way to bring the accessibility of that social life back." Over the next four to five months, the 12 full-member families will start to design the community, and move into permitting and full design as more people come on board.